Well, with the bacon leftover from the appetizers and the last of the tomatoes from the garden there was only one thing on my mind to make, a loaf of homemade Challah for BLTs. 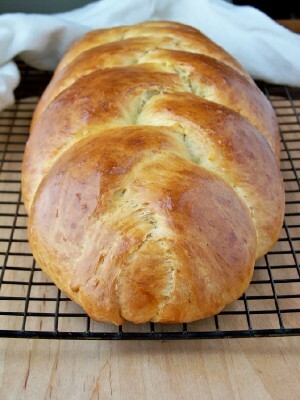 Challah is a Jewish bread very similar to the French Brioche. 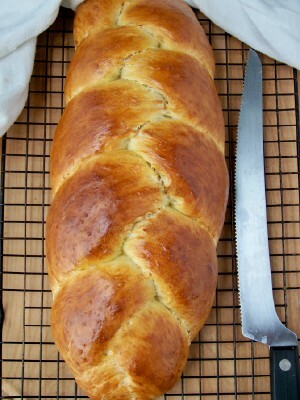 It is a basic bread dough that has been enriched with eggs and butter that is braided for a beautiful presentation. Now, I know what you are thinking. Why go through all the trouble for making your own bread? Because it really does make a difference to the sandwich. The firm texture holds up beautifully when toasted, the taste is just delicious and your house will smell sweet, buttery, and oh, so good. Those flavors are a perfect match for the salty bacon and savory tomatoes. So get out your standing mixer or make it by hand. Please give this a try, you will be glad you did. Combine all of the ingredients and 3 1/2 cups of the flour in the bowl of a standing mixture. Mix on low for 4 minutes. With the mixture on low, gradually add the remaining flour a little at a time until you achieve a soft but not sticky dough. (Note: you may not need all of the flour. It will depend on the moisture level in the air.) Turn the dough out onto a lightly floured surface and shape into a ball. Lightly grease a large bowl with cooking spray and place the dough into the bowl turning once to grease the surface of the dough. Cover the bowl with plastic wrap and let the dough rise for 1 1/2 hours. Gently deflate the dough and turn out onto a lightly floured surface. Divide the dough equally into thirds. Roll out each portion into an 16 in rope. Place the ropes 1 in apart onto a parchment lined baking sheet. To braid, pinch one end of each rope together then gently fold each outside rope over the middle rope alternating sides just as you would if you were braiding hair. Cover the braid with a clean kitchen towel or a lightly greased piece of plastic wrap. Let the dough rise for another hour. Preheat the oven to 350º. To make the wash, mix together the egg and water and gently brush over the surface of the braid. Place in the oven and bake for 35-40 minutes. Remove form the oven and let cool completely on a wire rack. Enjoy! I noticed that you didn't mention any kneading of the dough. Is this correct? The dough is mix/kneaded for 4 minutes before adding the remaining flour. I just made this bread but made 8 rolls instead of a loaf. Dad and I have thoroughly enjoyed using them in sandwiches. Perfect sweetness and texture.